Martin Del Campo, AIA, a UC Berkeley / CED professor, mentor to CASA members and San Francisco Architect for 50 years. This award is given to Masters students. Bob Esparza, one of the original founders of CASA in 1971 who became a leader and guiding force behind the student organization in it's early days. This award is given to undergraduate students. Antonia Escobar, the maternal grandmother of Mr. Higueras, an immigrant from El Salvador. This award recognizes women studying at CED in honor of the strong and inspirational women throughout Charles' life - his grandmother, mother and wife. ThirdWave Tech Prize, this award consists of technology (hardware/software) to provide low income students the tools they need to compete and succeed at CED. The cost of higher education has grown exponentially and attending the University of California is no exception. It has resulted in considerable debt burden for too many students, but none so acute as for students from historically disadvantaged communities. Today the challenge has deepened, often resulting in an uneven playing field, financial hardship and crushing student debt. With high school dropout rates in California at alarming levels for students of color, admittance into the College of Environmental Design (CED) is a significant achievement. CED is one of the top ranked multi-disciplinary design schools in the world. Unlike other Cal donations websites, this one supports students that are likely to come from families of modest means, inner city schools, or the agricultural fields of California. The CASA Alumni Scholarship program has joined with Latinos in Architecture (LIA), the Center for Architecture Design, and the San Francisco Chapter AIA to create a 501(c)3 mechanism for tax deductible contributions. 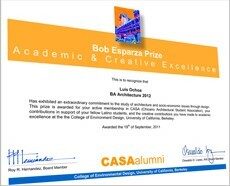 It is the ambition of the program to offer substantial awards to help defray the high costs of attending Cal. Students who exhibit excellence in their academic work, commitment to the larger community, professional promise, and promote CASA's mission are recognized with scholarships.